Hell Toupee App: You are the pilot, as Trump's wonderful "do" takes flight. Fly up and away, and then try a Mohawk, a Mullet, Barristers' wig, and more. Challenge yourself to fly Trumps Hair Toupees through obstacles seen and unseen. Navigate well or be Fired. This warm hearted parody is challenging and frustrating; sometimes beloved, sometimes feared but always entertaining. Like the Man Himself. Orlando, FL, February 17, 2016	(Newswire.com) - As primaries draw near, one need do nothing more than count the Apps to know which candidates are truly popular. But in that veritable sea of Apps, some attain greater heights of foolishness and satire. Like Hell Toupee App. Hell Toupee is a parody of Donald Trump's hair, and it is billed as "irreverent Hilarious and Stupid". In Hell Toupee you pilot Donald Trumps hair, as it flaps and flies into the blue. You tilt the phone to steer. The game is more challenging than it sounds, and you navigate well or find yourself "fired." Gameplay can be addictive, and alternately maddening or fun. Similar to Flappy Bird - but more random and satisfying. Each level offers a slightly different head covering, from Mohawk to Magistrates Whig. The usual suspects one might expect to thwart an ambitious toupee are here; Former Secretary Clinton, former Governor Bush. At one point a group of Chihuahuas race out to block your progress, barking off-color insults. 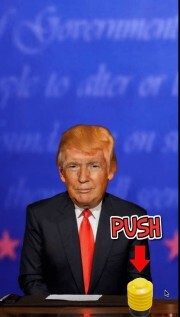 Hell Toupee App works on iPhone and Android and does cost .99 cents. Well spent in my opinion. A warmhearted spoof/parody/satire that makes you the Pilot of Donald Trumps Hair - Fly, fly away. Thru obstacles seen and unseen. All to reach the final ending. DON'T SHARE THE SURPRISE ENDING! !